Welcome to the home site of Cynthia "Cindee" Carlson and Esquire Great Danes. 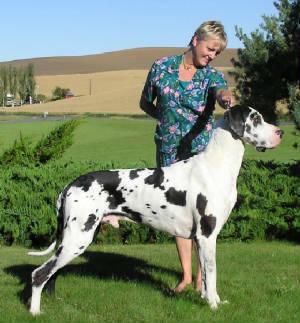 Esquire Great Danes is a small boutique breeder in eastern Washington state. We focus on harlequin and mantle great danes, primarily as companions and beloved family members and secondly as potential show dogs. Founded in 1994, we breed sparingly, perhaps having one litter every few years. 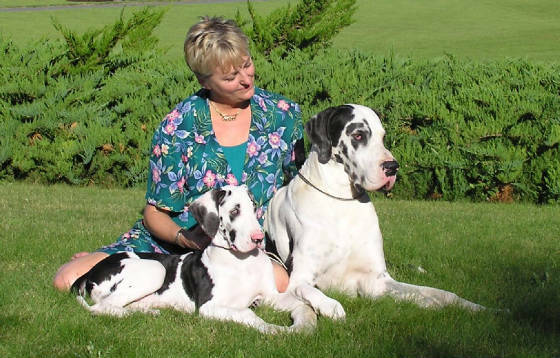 We have had particular success showing 3 generations of our natural-eared great danes to their championships, although we have bred, shown and finished danes with cropped ears as well. Our home is on rural farmland in a beautiful area called The Palouse. We currently have 6 great danes gracing our home, many of whom are older and retired from the show ring. Our beloved girl, Sunny, is 11 years young and still going strong, although sadly we lost our Sterling at 11+ over the 2013 holiday season. Our menagerie also includes 1 black Clydesdale mare with chrome, a gorgeous black and white Drum Horse filly, 2 Morgan mares and who knows how many rescue cats that have adopted us and now have heated beds, water bowls and warm fuzzy houses on the front porch and in the barn. Cindee, the person behind Esquire Great Danes, retired from her equity partnership as a business litigation attorney in Silicon Valley and, after returning to the university, earned her veterinary degree from the Washington State University College of Veterinary Medicine. We are passionate about our danes, and about all of our animals. The occasional puppies we have available go to well-scrutinized homes, and we take steps to stay in touch with their owners and remain involved in their lives. Any litter here is whelped in our home. Cindee stays 'round the clock with mom and babies for many weeks, sleeping in the whelping box until all eyes are open and maybe relocating to a bed in the same room. The Veterinary Teaching Hospital at WSU is only a short drive from our home, providing excellent emergency and routine care for all of our animals when necessary. Please take a look around and enjoy your visit. This site is always under construction, so please bear with us. No puppies are currently available, but feel free to contact us about litters that may be sired by Esquire Boys. We hope to do a breeding in June or July of 2014. If successful, puppies will be ready to go home in the Fall.